Even as a child I was captivated by the stories of St. Francis’ love for nature, and his ability to talk with birds, wolves, cicadas- with all creatures. It seemed like an enviable but supernatural ability beyond my grasp- but I discovered how natural it can actually be. After all, most of us talk to our pets and never think anything about it- but talking to creatures in nature, and having them respond, seemed like another matter altogether. Turns out, I was wrong. In our center in Assisi, there is a flock of white doves that regularly congregates on the terrace and roof of our meditation hall. Though there are ordinary pigeons all around Assisi, our center seems to have attracted only white doves. They personify the Holy Spirit of that place- like the pair that still nests in the hands of the statue of St. Francis by the rose garden at Santa Maria degli Angeli. To my surprise, the entire flock, instead of flying off as usual, started walking to the top of the stairs leading to the meditation hall, making it imposible for me to enter without shooing them away. So I said, “Well, if you want to join us, you need to let me by so I can open the hall.” To my utter amazement and delight, they trotted over to the side to let me pass. I thanked them, and they then flew up to the roof over the hall and continued their happy cooing! Simply trying to experience life through Francis' heart revealed to me a whole new level of appreciation for his inspiration in the Canticle of the Creatures! His intimate connection to all creation was not mere poetry, but his lived experience! It can be ours too! Imagine living in a town where rival parties intermittently break out in local gang wars and include neighboring cities. The private armies of various kings and nobles sweep through town periodically, taking freely from the local populace as compensation for fighting the nobles’ battles. Consider too that the Church is an active participant in this jockeying for power and control. There is an ongoing competition for dominance between Church and State. And yet the arts thrive, and cities vie with each other not just their military and economic conquests, but also for their cultural achievements. Welcome to the dynamic of Assisi and the Italian Península in the XII and XIII centuries! Fast forward eight hundred years, and in some ways the pattern seems the same. The gangs have changed to syndicates, the armies are corporate, and the politicians have replaced the nobles, yet each considers “doing our thing”, to be sanctioned by the rightness of their particular preferences. And most people either get totally caught up in the turmoil of it all, or try to run away from reality, living in denial, and run themselves ragged either way! Just living in a world of such tensions can put our minds into hyper-drive, and stress becomes our greatest health risk. ​on which the transformation of our experience depends. This is precisely what Saint Francis did by committing himself to a life of radical simplicity, of profoundly compassionate humanity, and of fundamental internal receptivity to a higher purpose and will. His example of ultimate connectedness, through ego transcendence, cut through the illusions of both the religious and secular worlds in which he lived. His life and teaching revealed the joyful alternative of the ego’s surrender to Divine Providence, rather than to the conditional and unreliable providence of either Church or State. The lesson remains true even today. The key to Francis’ inner freedom, and his legacy to humanity was to learn to listen, to learn to not be so reactive, to get out of his head and into his heart, In this way he was guided by a higher will than his own. There is a wonderful story that Francis and his most devoted companion, Brother Leo, were walking down the road one day and came to a crossroads. Leo was filled with evangelical zeal to preach the Gospel to people in need, so it seemed imperative to pick the right road to reach those most deserving of the message. He asked Francis, “Which fork should we take?” Francis, who was nearly blind himself, told Leo to stand in the middle of the crossroads, close his eyes, and spin around until he told him to stop. Leo was surprised, but obeyed. When Francis finally said “Stop!” they followed the road Leo ended up facing! The road to fulfillment lies ahead. Learning to be guided to it by surrendering the ego’s attachments is what is called spiritual practice. 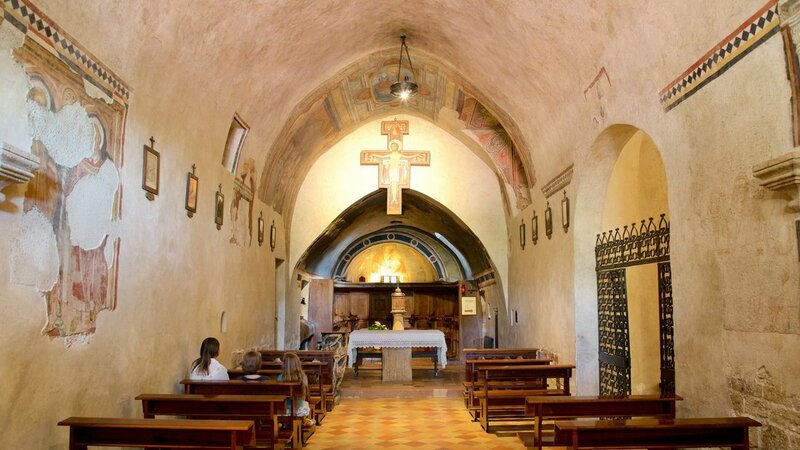 ​Our group was meditating in San Damiano, where the cross first spoke to Saint Francis centuries ago. Here he heard the words “Francis, rebuild my church”. He was at a dire crossroads in his life; he desperately needed direction on what its course should take. He was wide open and listening with full attention to the wisdom of his heart. We were asked to feel the emptiness and peace within, and simply to listen, without expectation. If we had a particular question or concern, we could put it on the inner alter and then let it dissolve in the quietude. As I settled down deep inside, I heard these words: “Know that I am always with you. I am here fully available, fully awake, in this moment. You need nothing else.”. And for the cherry on the cake, it seems that I was given yet another moment the following day to underscore the precious teaching I heard. Our group was walking up to Mount Eremo to meditate in the caves that Francis and his brothers frequented, to dive deeply into the stillness and the beauty of the pristine nature there. As we were walking on the trail that the saints took, I saw a piece of paper with some writing on it. Without even thinking, I said to myself, “I will take these words as a personal message to me from you, God.” It was written in Italian, so when I got home I immediately translated it. teneramente, carezzato, compreso, incoraggiato e diffuso dal tuo Dio! Se tu potessi capirlo, “impazziresti” di gioia. Tenderly, caressed, understood, encouraged and protected by your God! Let me repeat it again and again. For when you understand it, you will go mad with joy. 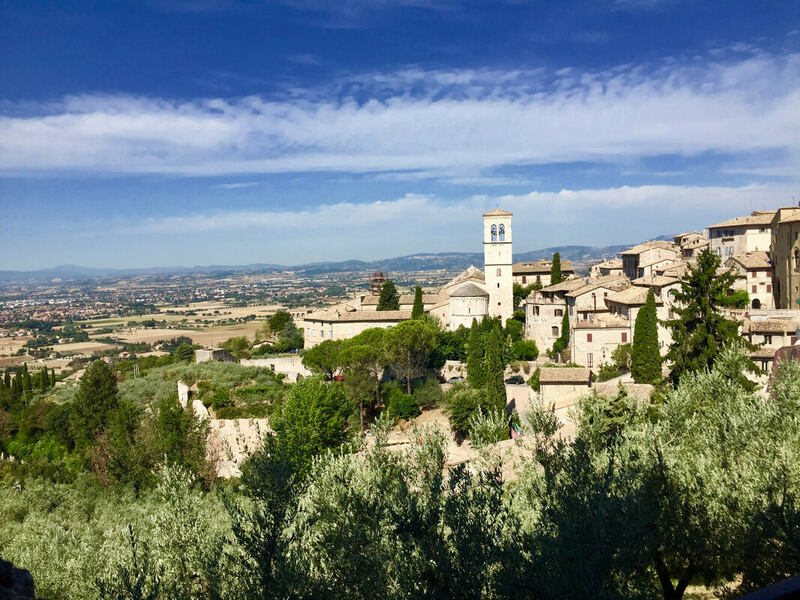 During our retreats in the sacred environment of Assisi, it is my experience that we witness miracles, shifts of perspective and deep transformation as we open and listen to what our true heart really wants to tell us. 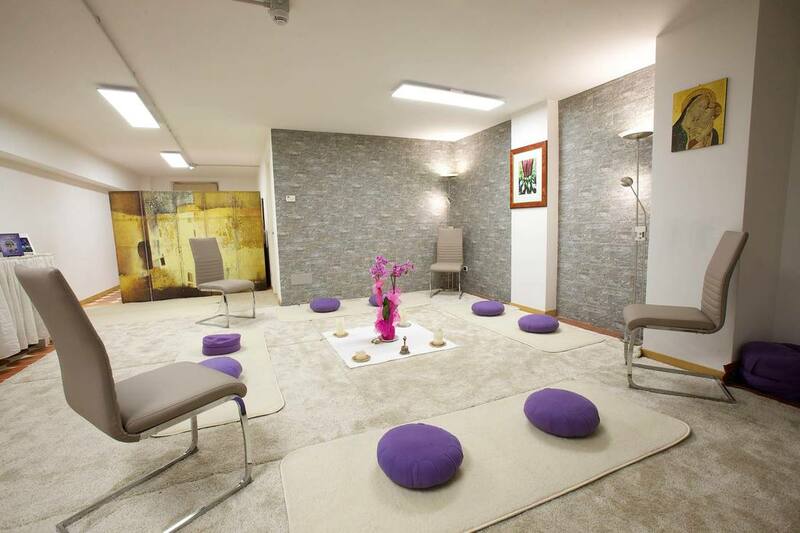 We are so happy to share our new meditation room with you.. The peace of Assisi wraps around us and holds our hearts !!! The first level of attention is external: we focus on the various elements around us (whether the wording, trappings and choreography of the liturgy, or of our daily routines). Even if we are filled with devotion and enjoyment of them, believing they make us happy, to stay focused there alone is a trap, because by nature externalities are impermanent, so if our joy is dependent solely upon them, we are doomed to lose that bliss when the externalities change. So much for our acquisitiveness and material dependence! Logically, then, we must go deeper. Simeon then speaks of the second level of attention as mental prayer- in which we shut out external distractions, turn within, and contemplate a particular object of our interest- be it a name of God, a sacred image, or uplifting ideal, even a secular one. The problem there is, we are then stuck in our heads, and apt to get caught in the constant mental churnings of “what ifs” and “if onlys”… and never find peace, because of our mind’s constant busyness. Simeon likens being stuck in our minds to boxing in the dark, where we can’t even see our oppponent. So apparently, we must go still deeper – to the prayer of the heart. This third level of attention is not about sentimentality or warm fuzzy feelings. It is literally about getting to the axial point in our center- the hub from which everything else radiates. To get into the heart we must penetrate the roadblocks of fears and desires that surround it. This requires developing our capacity to listen, in silence, and without judgment, to whatever is going on within or around us. When we do that, refusing to get caught caught up in or identify with the particular content of our mental activity, by letting go of all that, we penetrate that barrier, and achieve a clarity and peace that then informs and illumines our thoughts and actions. We’re not talking about intellectual understanding, but directly enlightening experience. As a well-known prayer says, “The peace of God surpasses all understanding”, and it transforms the quality of living into something truly joyful. Sounds easy- and in principle, it is. In practice, however, it may take some work to break old habits that tend to block us from experiencing it. For me, one of the most helpful tools in getting out of my head and into my heart is to be aware as much as possible from moment to moment, where my energy and focus are- and if I’m in my head, I redirect my focus to the center of my chest and simply breathe, fully and slowly. Every mystical tradition on earth speaks of the power of the breath, and of the stillness of the heart as the temple, the illuminating place where we actually experience divinity. “Be still, and know”. That is divine. To get there we need free ourselves from the tyranny of the mind. A Spanish mystic once described the process of overcoming that tyranny perfectly: “When my mind becomes agitated, I take a lesson from the fishes, who, when a storm arises and troubles the waters, dive deep, where the waves cannot batter them”. So, unless your goal is to surf the tsunami of your mind, (good luck with that), take a deep breath, and dive deeper into your heart! We were meditating at the impressive and yet stark tomb of St. Frances. It can only be entered by going down, down, down, descending all the 3 levels of the grand basilica. The narrow medieval stone staircase beckons all into the dimly lit crypt. I felt like I was being lowered down into the innermost depths of the cave of my heart. The energy here at the ‘tomba’ is so palpable and strong. The presence of St. Francis and his 4 closest brothers who are also there, invite us to effortlessly plunge into the spacious quietude inside. 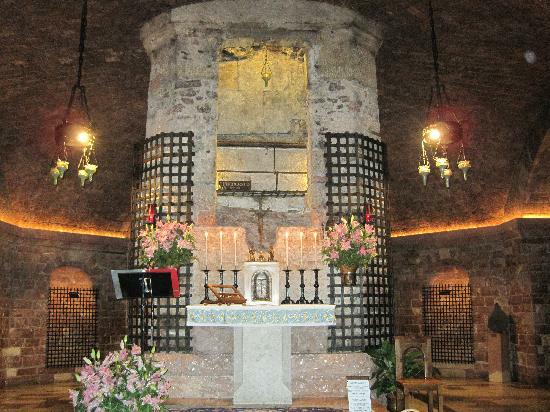 As I was listening to the continual river of pilgrims whispering prayers, gently shuffling their feet as they circumnavigate the immovable crypt , I had a beautiful experience: these gentle outer sounds were mirroring the soothing inner sounds of thoughts and sensations that were around or above my heart, but were not all all affecting the deep silence radiating there. 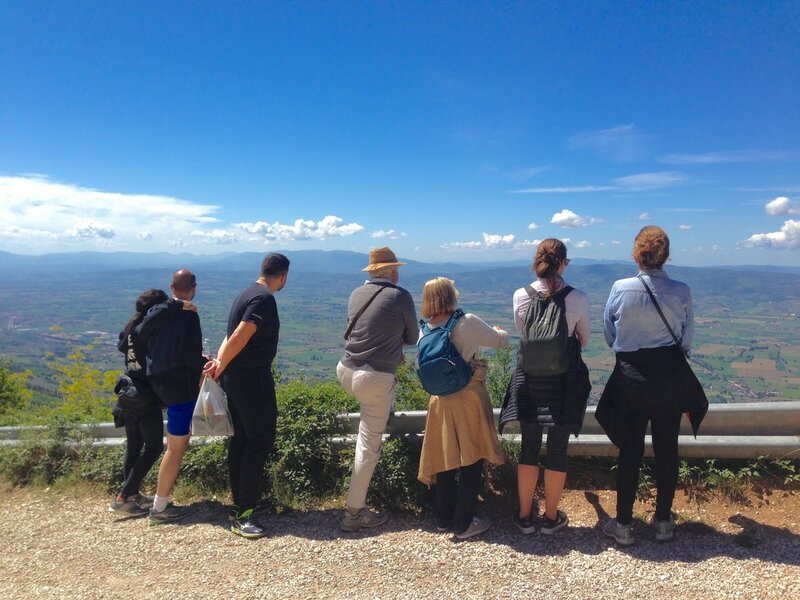 Everywhere we stop and meditate in Assisi, whether it be in a basilica, garden, convent or in an olive grove, our rich contemplations always bring us home to the heart. The vibrant beauty and the lives of Francis and Claire that walked everywhere we go, make this retreat so unique and special. There are a few things I have found consistently and inescapably helpful in dealing with the “big issues” of life. One is a firm conviction that there is a higher truth greater than our human egos, a consciousness or energy, by whatever name we choose to call it, that keeps this complex universe moving along with astonishing precision and harmony- the deliberate embrace and acceptance of which results in tangible improvement of our quality of life. The other is doing some basic practices that come under the rubric of paying attention and living consciously, that significantly increase our ability to embrace that higher truth and reap its benefits. Breathing fully, using the anchoring rhythm, sound, or even remembrance of a mantra, sacred name, or an uplifting thought, continually contemplated, to keep us on an even keel during our daily activities; being selective about keeping positive company- both physically and mentally; eating healthy food; taking reasonable care of our bodies- all these are tools for living more fruitfully, and for confronting life’s difficulties more effectively. They constitute the essence of spiritual practice. There is nothing inherently mystical or mysterious about them- they are the basic curriculum of the “School of What Works”, the practical, “applied spirituality” available to anyone who chooses to learn them. Being conscious may sound like a dumb goal, because we assume we already are. But how aware are we really- from moment to moment- of all that is going on, both around and within us? Take a step outside, stop what you’re doing, and pay attention: just see how many things your can see, hear, smell, taste or touch. I can guarantee that you’ll suddenly become conscious of just how unconscious you were five minutes ago! But do you really want to be fully conscious of everything all the time? Isn’t that a sort of exhausting, circuit-breaking sensory overload that would just become overwhelming? Perhaps. But even becoming briefly aware of the sensorial wealth within and around us can make us appreciate life, and shake us out of our mental habit of finding ourselves, our relationships, or our world disappointingly lacking. With practice, that awareness incrementally shifts from brief glimpse to habitual state.